As part of my Panasonic #ExperienceFresh series, I’ve been trying out the MJ-L500 Slow Juicer. It’s definitely been my favourite kitchen gadget to test!Disclosure: I was loaned a Panasonic MJ-L500 Slow Juicer for testing and review. The opinions below are my own and unbiased. Everyone knows that we’re meant to eat plenty of fruit and veg. Now the experts are telling us to aim for 10 portions a day, and that really takes some doing. Drinking a glass of juice each day is a simple and delicious way to get one of your portions. And squeezing your own juice at home is the best way to get the very freshest juice, packed full of nutrients. There are two types of juicers: fast/centrifugal juicers, and slower juicers. Although the jury is still out on the matter, there is some evidence that slow juicing may preserve more of the nutrients in your juice. That’s because the slight heating effect of centrifugal juicing can damage delicate nutrients such as vitamin C.
The Panasonic MJ-L500 is a slow juicer with a 150W motor with one speed and a reverse setting. It looks sleek, and doesn’t take up much room. That’s a real benefit, because you can leave it on your kitchen counter, ready to use whenever you want to. It is very quick and easy to slot together and it feels very solid so it won’t wobble around on your work surface! The juicer is also incredibly easy to use. You simply turn the machine on, and then feed small pieces of your fruit and veg into the chute. If you are using a combination of varieties, then it’s recommended to alternate between them. The stainless steel screw turns around, squeezing every last drop of juice out of the fruit and veg. The MJ-L500 is supplied with two jugs: one with graduated measurements for collecting the juice, and another to collect the pulp. It takes just a few minutes to extract enough juice for your morning glass, and I was impressed to see that the pulp comes out very dry. You just know that every last drop of juice has been extracted from the fruit and veg. You can use frozen fruit and veg in the MJ-L500, but it needs to be slightly defrosted before you put it in the juicer. And the juicer even comes with a special attachment for making frozen desserts and sorbets. This is my absolute favourite combination, and it’s what I order when I buy a juice to refresh me when I’m out shopping. 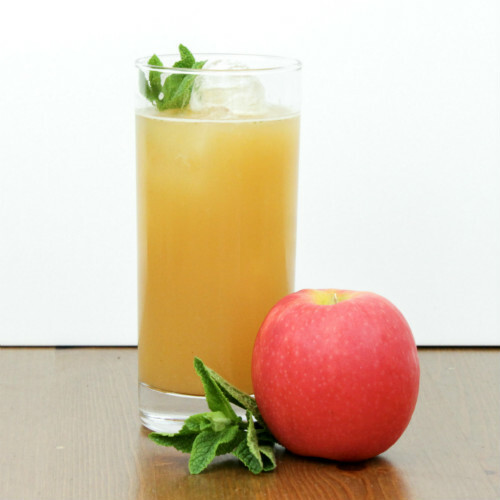 It’s a lovely sweet juice, with the freshness of mint and a zingy kick from the ginger. It’s ever so reviving! I used four Pink Lady apples, because I love the sweetness of that variety. I also added 6 mint leaves and a 2.5cm piece of ginger. You need to peel the ginger and cut it into small pieces. I cored the apple and cut each one into eight pieces to fit into the chute. This combination delivers anti-oxidant Vitamin C and Beta-Carotene, which converts into Vitamin A.
I used one orange and two large carrots to make my glass of juice. The orange was simply cut up into thick slices, and I chopped the carrot into fairly small chunks after peeling. 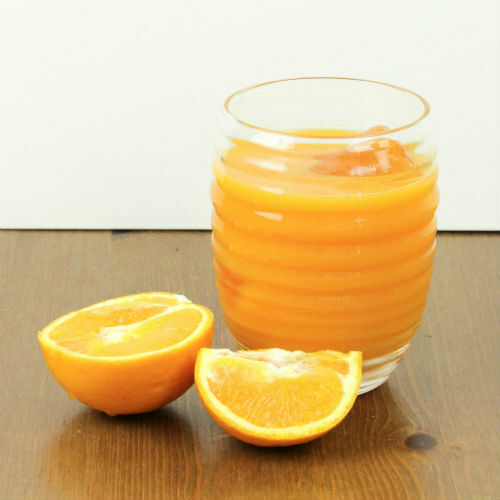 You get the fresh sharpness of the orange juice combined with the sweetness of carrot. It’s perfect to wake you up first thing in the morning! I was also impressed with how easy the MJ-L500 was to clean. The juicer just takes a few minutes to take apart, and the cleaning brush supplied gets into the nooks and crannies really easily. If you love drinking fresh juice and are thinking of buying a juicer to use at home, I’d highly recommend taking a look at the Panasonic MJ-L500. At £200.99, I think it is quite reasonably priced for such a seriously good piece of kitchen equipment. I really loved using the MJ-L500 and was very sorry when the time came to pack it up and send it back to Panasonic! The MJ-L500 costs £200.00 and is available from Panasonic online.